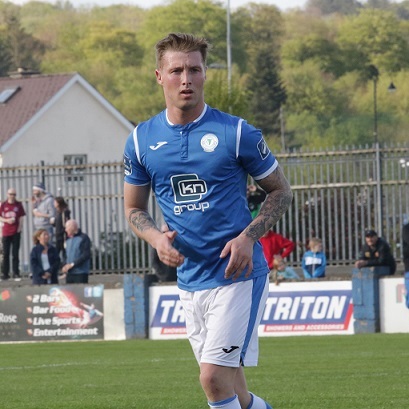 A goal deep into injury time at the end of the first half from Jesse Devers was the catalyst for what was a comfortable win for Finn Harps on Friday night. Harps had dominated the first half but they looked set to go in at the break on level terms before Devers turned the ball in after some wonderful approach play by Paddy McCourt. It meant Athlone’s gutsy defencive approach was breached at a crucial time in the game. And two goals right at the start of the second half ensured Harps weren’t going to slip up against the league’s basement strugglers. For the Ballybofey men, this was a first win in three games and ensures they move up into fourth spot in the table, overtaking Galway who lost at Longford Town. Harps gave a first start to former Sligo Rovers and Derry City underage player, Mikey Place who made his debut last Friday night in Wexford. Place featured up front alongside Ciaran O’Connor and he was hugely impressive, scoring one, and producing an all round display that earned him a warm round of applause from the home fans when he was replaced just before the hour. It was a Harps team that also included the returning Mark Coyle and Tommy McBride, both of whom were banned for the 1-1 draw at Ferrycarrig Park last Friday night. Athlone Town came to Ballybofey still seeking their first league win of the season. They were under pressure in the opening stages as Harps took the game to their opponents early on. Coyle, Ciaran Coll, playing more as an attacking wideman, and Place all looked particularly lively when coming forward From two set-piece situations Paddy McCourt’s quick-thinking released Coll and Coyle in on goal but on both occasions, their efforts were blocked. As the half wore on, the pressure on the Athlone goal continued. Cowan was just over with a header from another McCourt delivery and shortly before the break, Ciaran O’Connor turned the ball home after a sweeping Harps move, only to be denied by the linesman flag indicating offside. But the opener arrived almost two minutes into injury time at the end of the half. McCourt produced a wonderful, meandering run into the area and he squeezed the ball across the face of goal where Devers had the simple task of forcing the ball in from close range. It was 2-0 immediately after the restart when Coll’s pin-point deliver from the left was headed in by Ciaran O’Connor. Then on 51, Place raced clear after robbing defender Cormac Raftery of possession and he found the bottom corner with an excellent finish. It was a night to remember for young Niall McGinley too. The Harps U-19 player, who has done so well since his recent introduction to first team action, came off the bench to score his first senior goal, and Harps’ fourth on 79 minutes. Finn Harps: Ciaran Gallagher, Aidan Friel, Ciaran Coll (Michael O’Connor 75), Keith Cowan, Sam Todd, Tommy McBride, Jesse Devers, Paddy McCourt (Niall McGinley 53), Ciaran O’Connor, Mickey Place (John O’Flynn 56), Mark Coyle. Athlone Town:Mick Fogarty, Cormac Raftery, Ian Fletcher, Ger Smyth, Bashmil Nyakambili, Bob O’Leary, Josh Hogan, Aaron Brilly, Shane Stokes (George Mukete 71), Jake O’Connor (Steven Grogan h/t), Ollie Hamzat (Brian Cabrally h/t).